There are many benefits to running a 1x set up on a bike, simplified shifting and reduced weight to name just two. And there are just as many options on the market for converting your current bike’s drivetrain to a reliable 1x setup including the Wolf Tooth Drop-Stop chainrings. 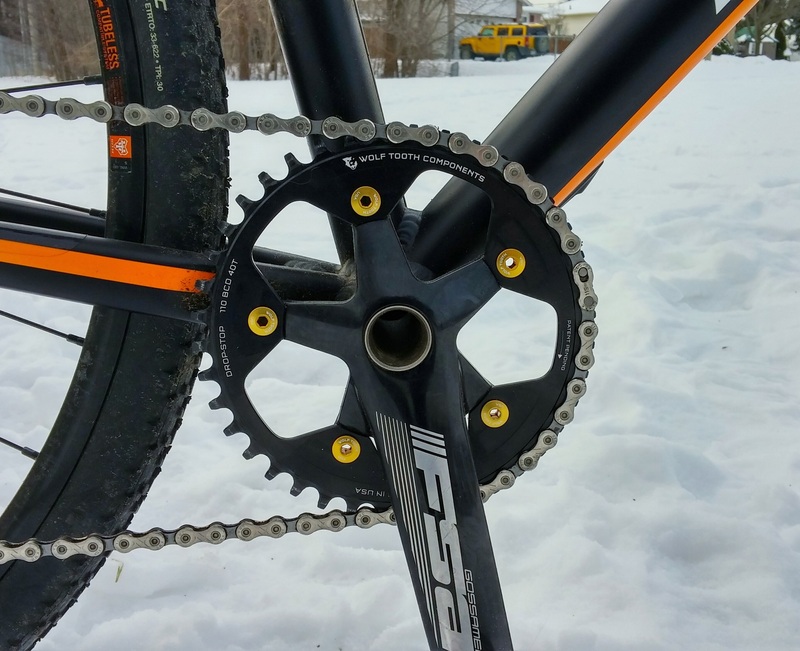 Designed and manufactured in Minneapolis, Minnesota, the Wolf Tooth Drop-Stop chainrings feature wide/narrow tooth profile for ultimate chain retention and mud shedding. The alternating narrow and wide tooth profiles match up with the narrow and wide links of the chain, ensuring a tight fit between chain and chainring. Wolf Tooth has a Drop-Stop chainring available for virtually every crank set on the market with prices starting at $59.95 USD. You also have a large selection of chainring sizes to choose from depending on rider strength and terrain ridden. Wolf Tooth also offers a variety of cassette cogs, up to 44 teeth, to expand the range of your cassette so any rider riding any terrain can experience the simplicity of a 1x setup. 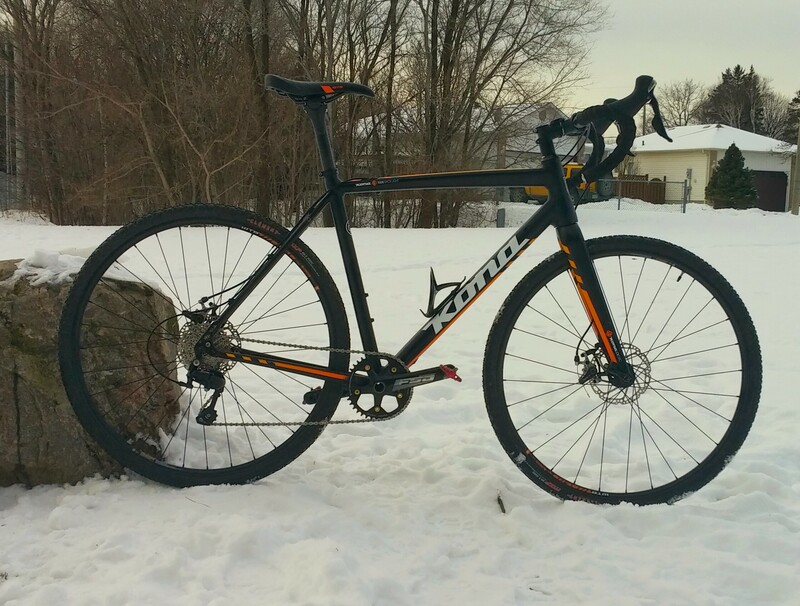 I received a 40 tooth 110 BCD cyclocross and road chainring from Wolf Tooth to fit on the FSA Gossamer cranks on my 2016 Kona Jake the Snake to review. Installation was easy. I just placed the single chainring in the outside ring position and used Wolf Tooth’s 6mm chainring bolts, which are available in a variety of colours, to secure it in place. Then I ripped off the front derailleur and the cable and my new 1x cyclocross set up was good to go. Its normally recommend that you use a clutch rear derailleur for your 1x set up to increase chain tension and improve chain retention. When I first installed the Wolf Tooth Drop-Stop chainring on my Jake the Snake, I was concerned about that not having a clutch rear derailleur would mean constantly dropping chains. I tested the Wolf Tooth Drop-Stop chainring on a variety of terrain from cyclocross race courses to light single track and I had zero drop chains. Bouncing over logs, rocks and down rough descents wasn’t enough to chuck the chain. The wide/narrow tooth profile gripped the chain and never let go. Even in the extremes of the cassette, chain retention was still spot on. I trust the chain retention of the Wolf Tooth Drop-Stop chainring so much that it will be part of my race setup for next season. Although a clutch rear derailleur would further improve chain retention and reduce chain slap, with the Wolf Tooth Drop-Stop chainring it was not necessary. And with so many options available from Wolf Tooth, the Drop-Stop chainring is a great choice if you are looking to convert your bike to a 1x setup. Note: Shimano does not offer a road clutch rear derailleur and their mountain bike derailleurs aren’t compatible with their road shifters leaving switching to Sram your only option if wanting a clutch rear derailleur for your road or cyclocross bike. 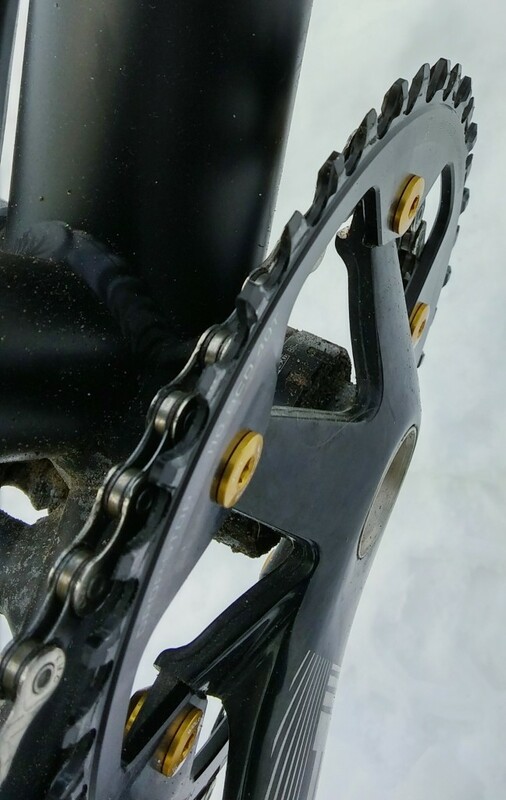 In my experience with the Wolf Tooth Drop-Stop chainring paired with a 105 rear derailleur, the clutch mechanism was unnecessary to ensuring the chain stayed on the rings.